FORT MYERS, Fla. (October 6, 2016) – Pediatric Dentistry of Ft. Myers, Dr. Tim Verwest, DMD donated toothbrushes to foster care children in Lee County. The donations will go to the Donate4Kidz Foundation. They provides care packages for foster care children in need. 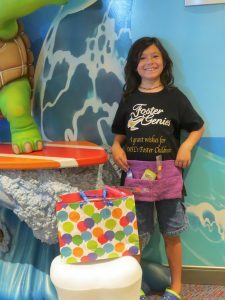 Sarde Howell, a seven year old home-school student reached out to the pediatric dentist for a community service project. “We deeply care about children in our own community and want to help out as many as we’re able to,” said Dr. Verwest. “We thank Sarde for letting us be part of his community project”. Pediatric Dentistry of Fort Myers regularly donates to improve community health and hygiene. In 2014 the office donated over 20,000 free toothbrushes to children in Lee, Collier, and Charlotte County.